Normally our Thanksgiving dinners are filled with glutinous desserts, but this year was a little different. With a few family members watching their sugar consumption our Thanksgiving menu took a change for the better! 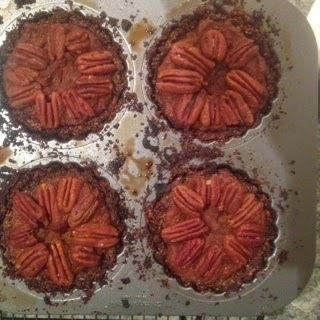 Above is a sugar-free, dairy-free, and gluten-free pecan pumpkin tart. Its filled with fiber, protein, and vitamin A - Now there's something to be thankful for! 2. Mix 2 cups pecans and dates in a food processor until it forms a dough. 3. Spray a muffin tin or mini tart pan with cooking spray. Divide the dough between the cups and press firmly so that you leave a spot in the middle for the batter. 4. In a large bowl mix together pumpkin puree, eggs, vanilla, almond milk, date butter, 1 tsp cinnamon, nutmeg, ginger, and salt. Divide batter between the cups. 5. In a small bowl mix together 1 cup pecans, butter and 1 Tbsp cinnamon. Top each cup with a bit of the pecan mixture. 6. Bake for 25-45 minutes depending on if you are making muffin size tarts or larger tarts.